Once clips are added to a Working Clip Reel the names of the clips can be edited and deleted as well as the order in which they appear within the reel. By default clips are named based on the name of the Clip Reel and the date/time when the clip was created. Click on the name of clip that is highlighted in blue to edit the clip name. Once clicked, the clip can be renamed. Clips can be removed from the Working Clip Reel by clicking the red minus sign. Once there is more than one clip within a Clip Reel, the order in which they appear can be edited. Click the = icon to drag and drop the clip to a different location within the Working Clip Reel. 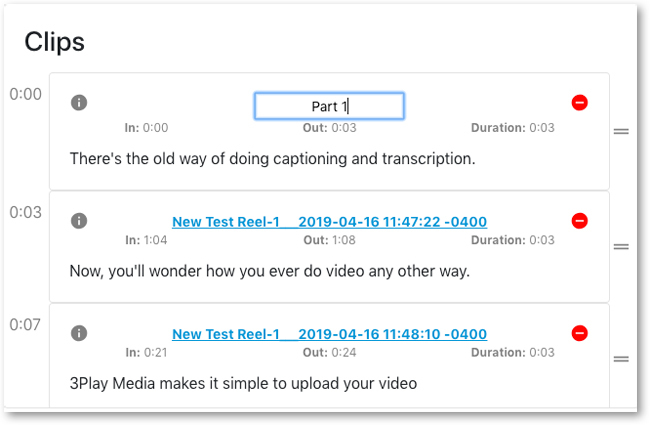 Alternatively, the clips can be rearranged by clicking on the timeline at the bottom, and dragging the Clip to a different location on the timeline.